A new book was published this year, featuring Joan Wilson as a contributing author. We are excited to see what we already know about the importance of brain development and play in print! 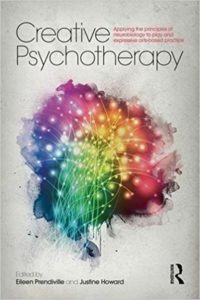 Creative Psychotherapy brings together the expertise of leading authors and clinicians from around the world to synthesize what we understand about how the brain develops, the neurological impact of trauma and the development of play. The authors explain how to use this information to plan developmentally appropriate interventions and guide creative counseling across the lifespan. Point in Time offers ‘Sunshine Circles’ Thera-play group programs in various schools and childcare centres throughout the county. Sunshine circles are interactive adult-led, structured play groups used to enhance the emotional well-being and social skills of children. They are designed to help children feel secure and valued, to get along with others and to feel part of a community. Sunshine Circles are playful & fun, intentionally accepting & positive, valuing & caring, focused on cooperation, experiential and they intentionally involve touch & proximity. Leaders and children hold hands for songs and games, dab lotion or powder onto hands and knees or put a hand on a child’s shoulder to reassure them. We know that touch is a powerful means of communication and essential in guiding children’s behaviour. Increasing comfort with ‘healthy touch’ is another goal of Sunshine Circles. Recently we have added a Parent-Child Sunshine Circles program as well and we have had rave reviews from the families whom have attended these so far. “The only way I could get my son to come to school was by telling him it was ‘Sunshine Circles’ day, he really loves attending and it is so nice to have 45 minutes of uninterrupted time with just him and I”. “We can’t wait for the next session to begin”. In January 2017, Theraplay® was awarded the highest rating for evidence-based practice by SAMHSA. Theraplay® is a special type of play therapy that can improve your child’s behavior in unique ways. Using the therapeutic benefits of joyful play and sensitive caregiving, Theraplay® focuses on strengthening your relationship with your child, enhancing your sense of connection and mutual understanding so that your child no longer needs to resort to problem behaviors. As the most important people in a child’s life, caregivers are actively involved in sessions. With the help of the therapist who is skilled at changing what may seem to you a permanent negative dynamic between you, you and your child will experience delight and enjoyment in each other, and your child will become more responsive to you.